Quick dinner ideas are life-savers! 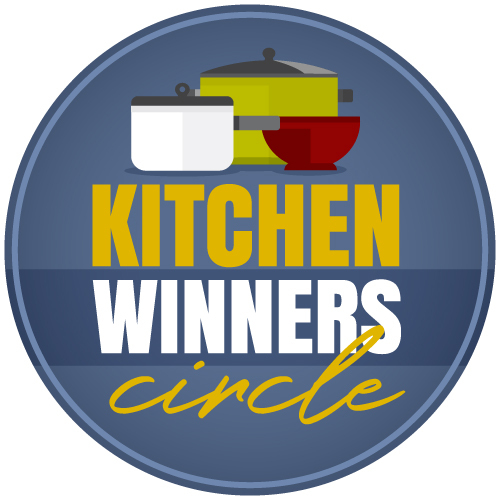 Not only do they help us make dinner quickly, but they also help us save money and help us eat more healthfully. Let’s say no to take-out this month. Don’t you just love tradition? I mean, Cinnamon Rolls on Christmas morning, and eating whatever you want on your birthday, and making sure that the nut butter covers both slices of bread with the jam in between. Tradition is important, people. I am a stickler for tradition. So as October is starting, so is another 31-day series on Good Cheap Eats. I’ve done this for quite a few years. It’s fun, and it gives me a chance to unleash new ideas in quick succession. 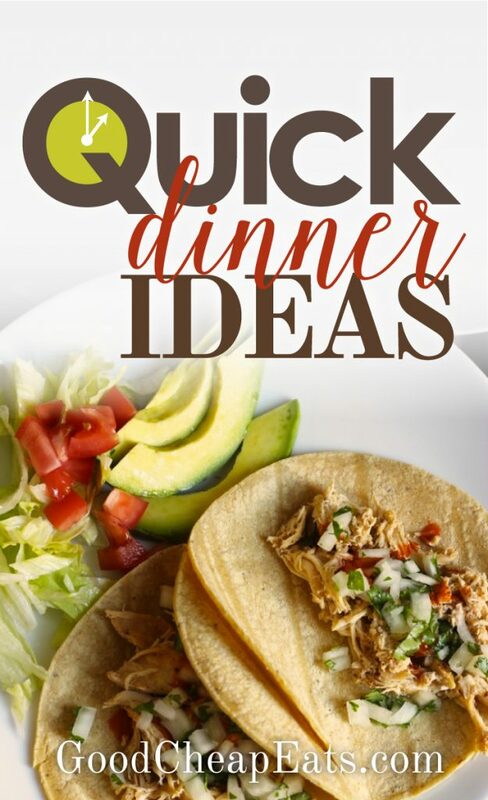 This year, in honor of my new cookbook and the idea that homemade dinners should be quicker and easier than running to Taco Bell, I’m going to be presenting 31 Days of Quick Dinner Ideas. 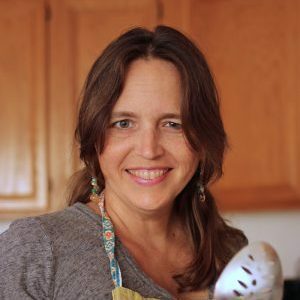 I hope you’ll join me throughout the month, as I share guest posts, giveaways, and good cheap eats to help you make dinner quickly, easily, and economically. Be sure to pin this post, as I’ll be updating it with links to all the posts in the series. If you’re feeling really pinteresty, you can follow my Quick Dinner Ideas Pinboard. Salade Composee: What the Heck is That and Why Should I Make It for Dinner? If there’s one thing that I’ve learned over the years, it’s that time always goes by more quickly than I think it will. I can have great plans to cook a long, leisurely meal, but inevitably, something gets in the way of my plan. Having a list of quick dinner ideas comes in handy at these times. So, we’ll be cultivating that list this next month. 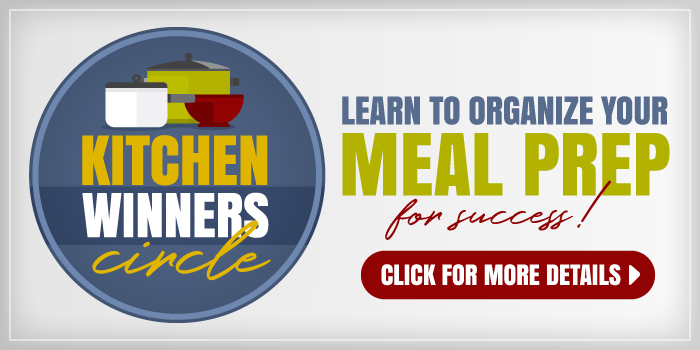 I hope you’ll come ready to share your tips and tricks for getting a home cooked meal on the table without a lot of hassle. What’s one of YOUR favorite Quick Dinner Ideas? P.S. I’m participating in 31 Days. Last night I had 30 minutes notice that I would be hosting three extra children for dinner. I made penne with meat sauce served with cinnamon rolls and applesauce. I always keep a variety of pasta in the pantry along with prepared meat sauce in the freezer. I try to keep at least a couple types of bread, rolls or muffins in the freezer as well. That way I can easily get dinner on the table in 30 minutes or less. First of all, I received my copy of your new cookbook from Amazon yesterday! Tons of good recipes. Congratulations on a successful launch! My favorite 30 minute meals are beans and rice (made with frozen cooked rice from the freezer steamed back into existence), pasta and prepared pesto with salad, chili dogs, salmon burgers from Costco, and breakfast for dinner. Tonight we got home from town with barely an hour to make something to eat, eat it and get back out + we also needed to finish picking our raspberries. So. . . I had a tomato basil soup in the freezer which started defrosting while we picked the rasps and then we made turkey sandwiches to go with our soup. And time to spare! Many times, I do my prep work in the morning and then when it’s time to cook, I have everything ready. Often times, prep work takes longer than the actual cooking process. Here is one recipe that I make when I don’t have time to fuss with a more time consuming dinner. In a skillet, cook beef and onion over medium heat until meat is no longer pink; drain. Add cooked noodles, soups, sour cream, mushrooms, and salt and pepper; mix well. Transfer to a greased 3 qt. baking dish. Bake, uncovered at 350 for 30 minutes or until heated through. This tastes a lot like Hamburger Helper but it’s homemade. Many times, I cook the noodles in the morning and let them sit till I’m ready. This cuts back on the time spent cooking this meal. Noodles can even be cooked the night before and refrigerated till needed. This time of year I try to plan crockpot soups that can cook all day. Night before last I cut up the onion, celery and potatoes and soaked the beans for Senate Bean Soup (a family fave). In the morning I put it all in the cp with water and ham shanks. Pulled the meat off the shanks when I got home and adjusted seasonings and made some corn bread. The big win is I freezed enough leftovers for another night. I ordered and received your new cookbook. I’ve already picked out several recipes to make. I’m now retired and have more time to cook but don’t want to be spending all my time in the kitchen! Thanks so much for your support! Enjoy! One of my favorite quick dinners is risotto. You can be creative and use whatever odds and ends you have around. It’s a great way to use cheese ends, a few stray vegetables, small pieces of meat that aren’t enough on their own. Risotto can be as simple (lemon and thyme) or as complicated as you like. It’s good filling comfort food. In the same vein, another quick dinner is an omelet. There, too, you can use bits and pieces of things.